Guaranteed Analysis: Calcium (Min)......14.56 % Calcium (Max)......17.44 % Phosphorus (Min)....8.00 % Magnesium (Min)....12.00 % Potassium (Min).....0.85 % Selenium (Min)........30 ppm Iodine (Min).........100 ppm Cobalt (Min)..........50 ppm Copper (Min)........1500 ppm Iron (Min)..........4000 ppm Zinc (Min)..........4500 ppm Manganese (Min).....4500 ppm Selenium (Min)........30 ppm Vit. A (Min).....240,000 IU/Lb Vit. D (Min)......60,000 IU/Lb Vit. 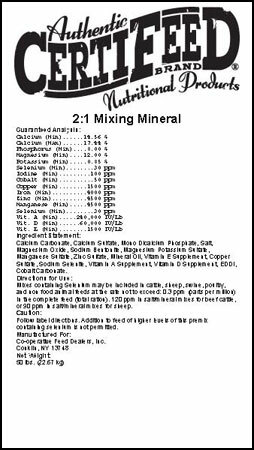 E (Min)........1500 IU/Lb Ingredient Statement: Calcium Carbonate, Calcium Sulfate, Mono Dicalcium Phosphate, Salt, Magnesium Oxide, Sodium Bentonite, Magnesium Potassium Sulfate, Manganese Sulfate, Zinc Sulfate, Mineral Oil, Vitamin E Supplement, Copper Sulfate, Sodium Selenite, Vitamin A Supplement, Vitamin D Supplement, EDDI, Cobalt Carbonate. Directions For Use: Mixes containing Selenium may be included in cattle, sheep, swine, poultry, and non food animal feeds at the rate not to exceed: 0.3 ppm (parts per million) in the complete feed (total ration). 120 ppm in salt/mineral mixes for beef cattle, or 90 ppm in salt/mineral mixes for sheep. Caution: Follow label directions. Addition to feed of higher levels of this premix containing selenium is not permitted.